Today I found my inner-pioneer. 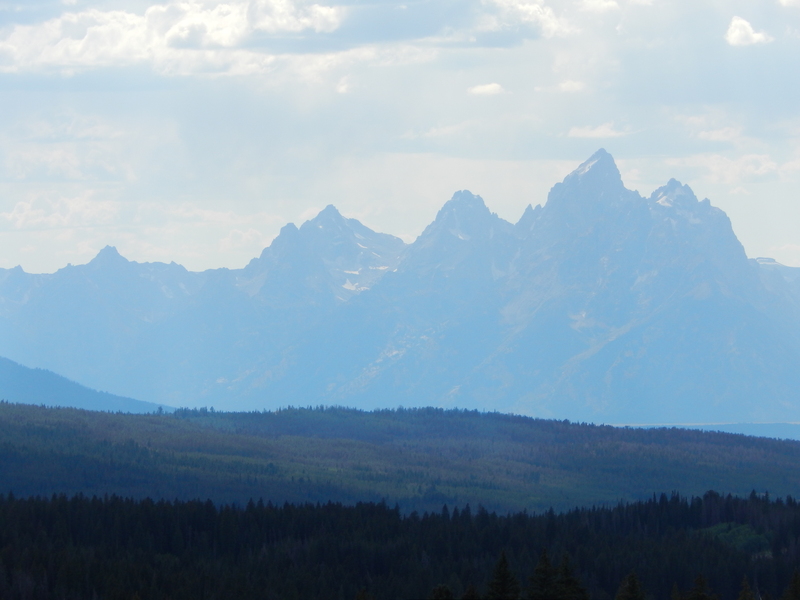 After exploring the Grand Tetons, and seeing NO wildlife, I was ready to hit the road to conquer Yellowstone at daylight this morning (for all of you city-folk: wildlife hardly stirs during the day in summer). Getting an early start was the right choice. 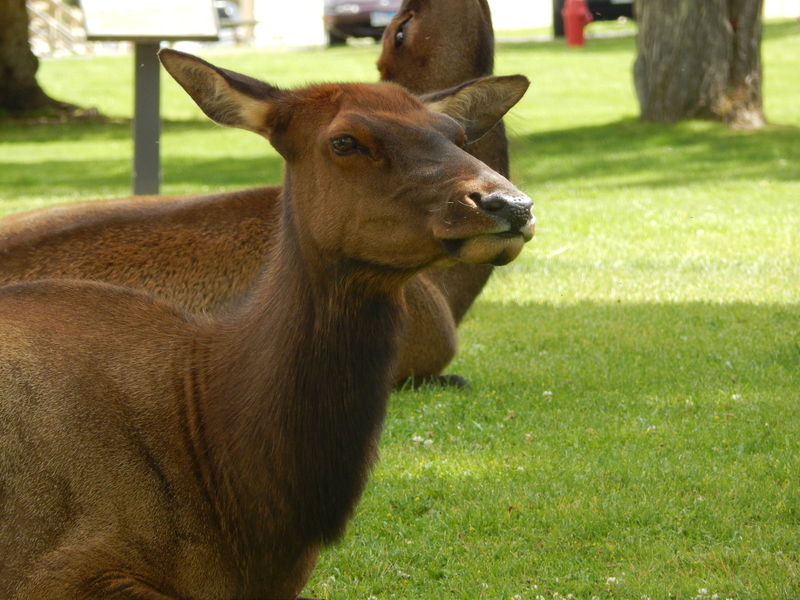 Not only were we able to explore Yellowstone in ONE DAY (unthinkable, impossible… whatever the park employees would like to call it…) BUT we also had incredible encounters with the animals of the park. Today was my Safari of North America. Riding high in a large SUV while scouting game can spark your imagination. We began at the south entrance. 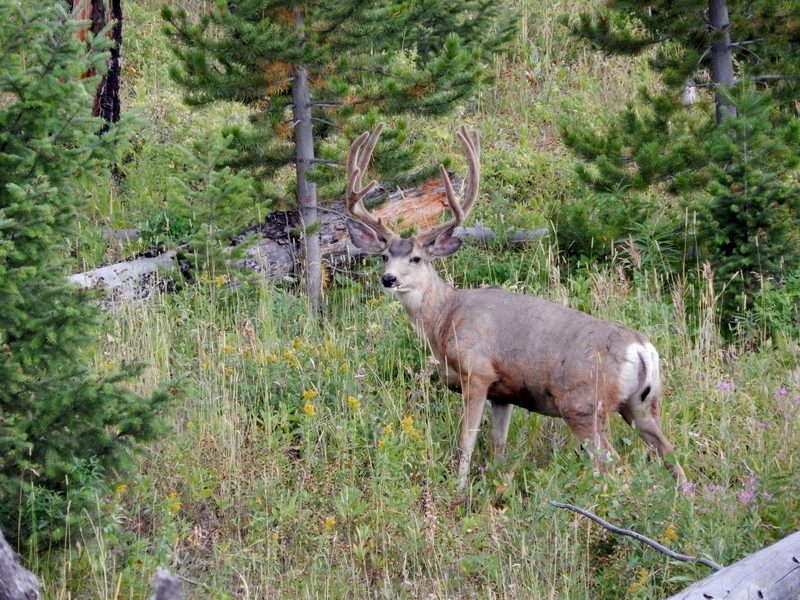 Mostly known for mule-deer (not to be confused with Elk even though they can look similar), it did not disappoint. 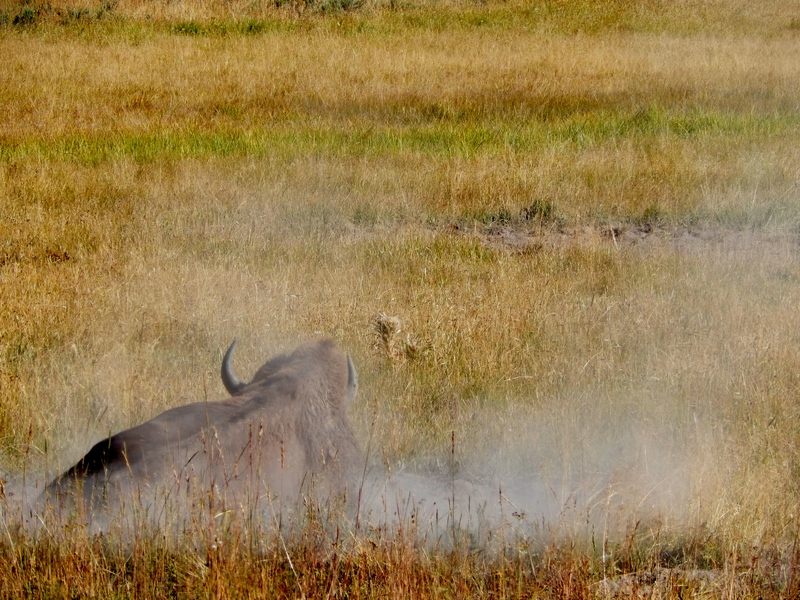 The thing about Yellowstone is that when something cool is spotted on the side of the road, people gather. It’s called a “jam”. 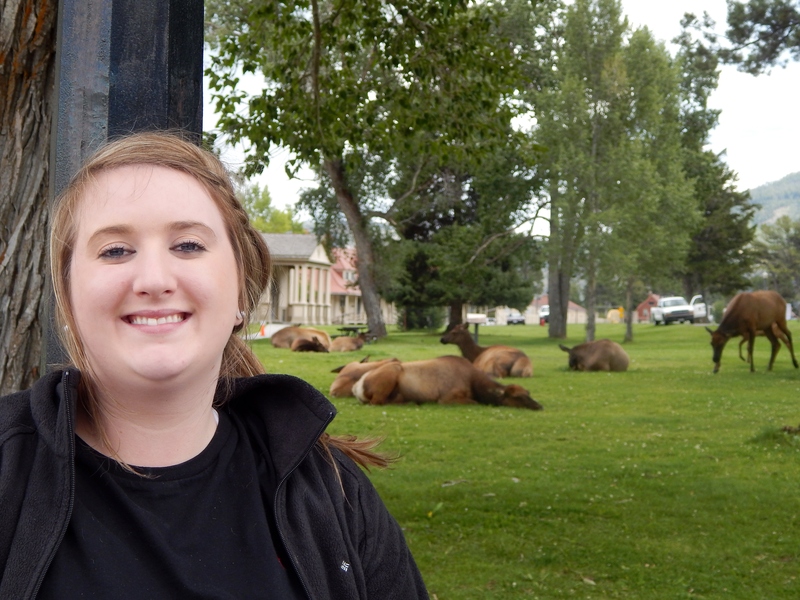 Today I met a bull elk with his herd of 12. Calves are always the cutest. He ignored me, (rude, but magnificent none-the-less). Moving west (while holding our breath to avoid the sulfur-fart-geyser-gas) we searched for the elusive bear while looping Yellowstone Lake. Thousands of Bison dot Hayden’s Valley. I was a little (okay a lot) concerned that they were going to ram the car. But they didn’t. Just a fair warning, they like to play in traffic. Their heads are huge and they definitely have some wacky hair-dos going on! The Lamar Valley was a spot I was particularly excited to see due to a special on wolves on the National Geographic channel. This heads east through the park, way out of the way. We saw hundreds of more Bison. I felt like a true wildlife photographer. 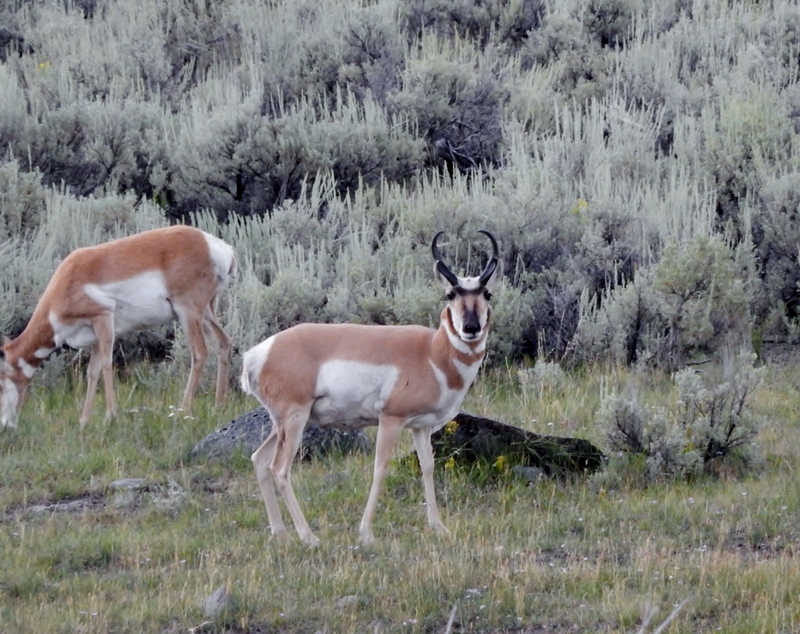 After pulling over to the side of the road and walking out into a field I was able to capture a Pronghorn family. It was at that moment, while down on one knee holding my Nikon with mountains all around me that I really felt ONE with the wilderness around me.Everything is at the mercy of mother-nature. 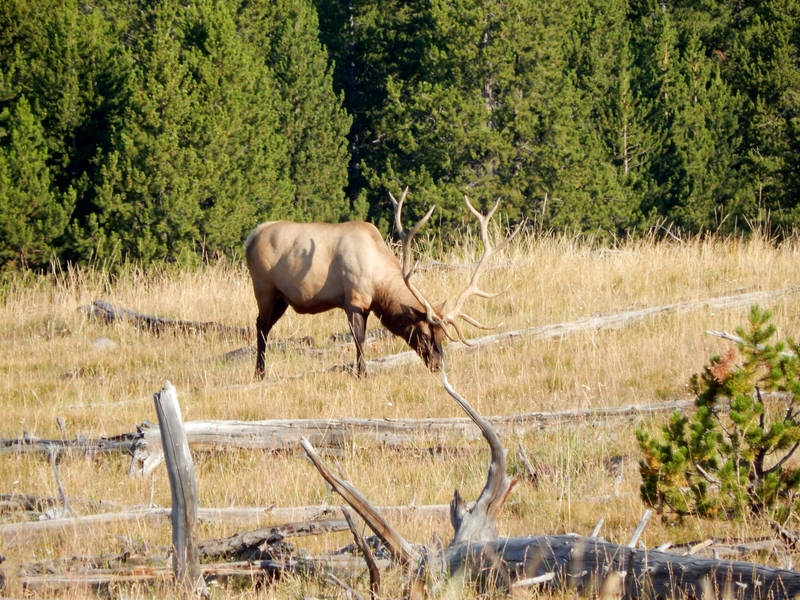 In a few short months that same valley would be covered in several feet of snow, with wolf packs chasing migrating Elk. For the last leg of the journey we headed back east, then to the far north. Still looking for my elusive bear and excitedly alert to be entering moose country (all day I had envisioned this huge moose in a marshy area with his beard dripping wet with water while chewing his cud). YEAH neither one of those fantasies materialized… the moose nor the bear… my only disappointments. But, in the midst of my disappointment this big-guy catches my eye. A master of camouflage. Picture me draped over the roof of a Nissan Pathfinder to become acquainted with this big-guy. And now for the end of the journey. THE GRAND FINALLY. You will never guess what sits at the North boundary of this park on the side of the road. Well, at Mammoth there is a community where employees live. 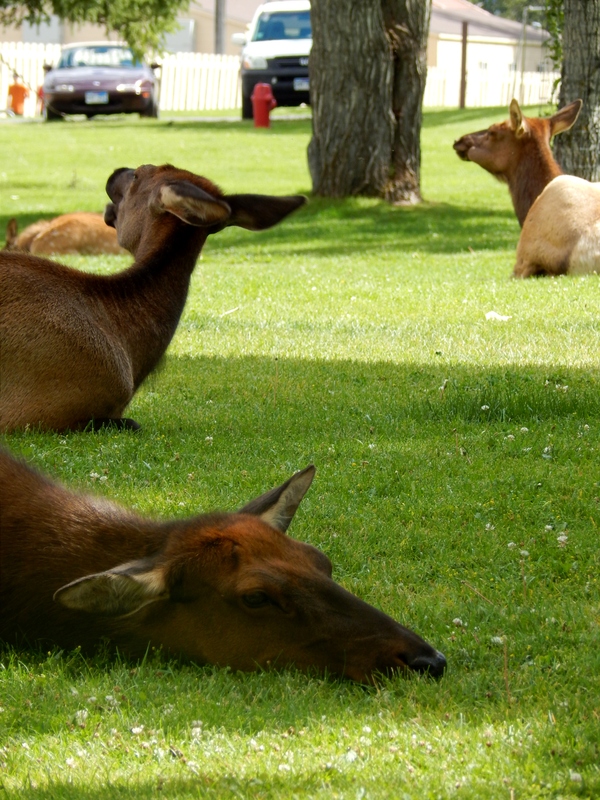 Around this area is nice, planted, fertilized yep you guess it… grass. Two comments: don’t expect to have A/C in any of your cabins in any of these nearby states. Don’t expect to have cell phone service for several days at a time! Now, on to Montana, Idaho, and Utah (and I’m still searching for the elusive bear and moose).